In every bathroom there is an importance in the storage solutions that we choose to install, and the way in which we use that storage to good effect. For some people cabinetry and other types of bathroom storage solutions are just functional and chosen for how much can be placed inside that storage, without much thought into the design and style. 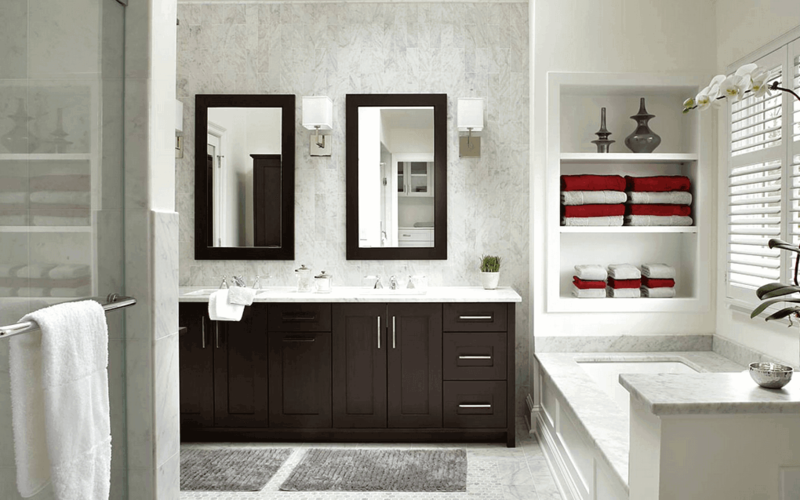 You can, however, choose to incorporate bathroom furniture and cabinetry of a high quality that speaks to and complements the overall bathroom aesthetic that you are aiming for. Storage of course plays a vital role in how a bathroom looks, feels and functions and with the right type of professional advice and know-how, you can choose storage solutions that are practical, functional, yet add a real sense of style to an elegant bathroom. The last thing you want to happen when choosing new bathroom furniture is for it to drag the eye away from the beautiful choices you’ve made in a bathtub or basin. It should be an important component of your overall bathroom design plan, incorporating elements of the style you are choosing for the entire bathroom, ensuring there is a common thread through every piece in the room as you paint an entire picture. There are so many different styles of bathroom and types of bathroom furniture that it can be bamboozling at times, and that is why it is important to seek out expert help with bathroom furniture, especially if you are choosing to go for a Victorian bathroom design or other type of Period style bathroom. One of the major ways in which you can make best use of bathroom cabinetry is to choose a classic vanity, the taller the unit the better. In terms of transforming a bathroom design layout, a tall vanity ensures that you can maximise the space of a bathroom (space that would otherwise be ‘dead’ space that is unused). This is of particular interest to those people designing a bathroom that is quite small and doesn’t afford much space to play around with the specification. A vanity unit is also a fantastic and flexible way to hide away pipework and other necessary areas of a bathroom that can become a bit of an eyesore if left exposed. A tall vanity is also a fantastic way to build a level of privacy if more than one person is using a bathroom at a time. The internal functions of bathroom cabinetry are just as important as when you are considering which type of kitchen unit to install. The greater the amount of space that can be filled, the better for the functionality of the bathroom storage potential. Drawers that roll out to allow for ease of filling make great storage spots for towels and other essential items. If you are considering choosing a classical, Victorian style of bathroom cabinetry and furniture to add to your bathroom design, it is important you choose suppliers with a high reputation for delivering quality goods. It can help to transform your bathroom into a stylish oasis, with plenty of functionality and maximum use of space.